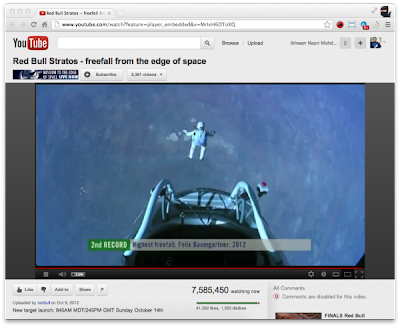 Felix Baumgartner jumped from the edge of space! and broke the world record! not sure the exact figure, but i think 128K++ ft. wow! 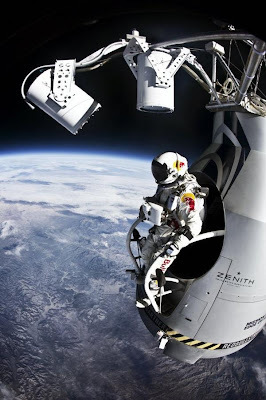 awesome man~~ Extreme athlete and daredevil Felix Baumgartner, jumped from a capsule nearly 24 miles above the Earth, setting a high-altitude free-fall record, while possibly traveling at supersonic speeds. He stands to have broken three records: the highest jump from a platform, the longest free fall without a drogue parachute and the highest vertical velocity. so, here are the photos...all of them are my own photos, screenshot and keep screenshot because too bored. except photo number 1, 4, and 9. too lazy to put the watermark. I'm so sleepy already. good night!